PARIS — Designer Clare Waight Keller unveiled her first menswear collection for storied house Givenchy at Paris menswear week Wednesday as actress Laura Dern caught up with The Associated Press at Valentino's display that channeled the darkly depths of monochrome. 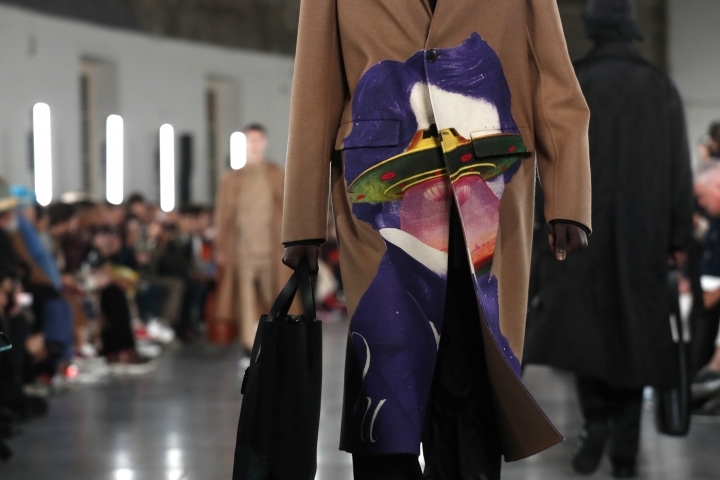 Keller, the house's first-ever female designer, reflected her growing confidence in menswear by holding the first standalone men's show since she ascended to the house's artistic helm in 2017. A small group of guests climbed the neoclassical steps of Givenchy's couture salons to discover Waight Keller waiting by masses of delicate baby's breath flowers that adorned the wooden Haussmannian floor. The beautifully constructed clothes captured the individualism of the 1990s in a contrast with the historic venue. In an unusual touch of class, the designs were explained by the 48-year-old designer as the garments were being showcased by models. The silhouette featured long, and sometimes flared, legs; oversized shapes; rounded shoulders; and flashes of bold color: violet, electric blue and fuchsia. 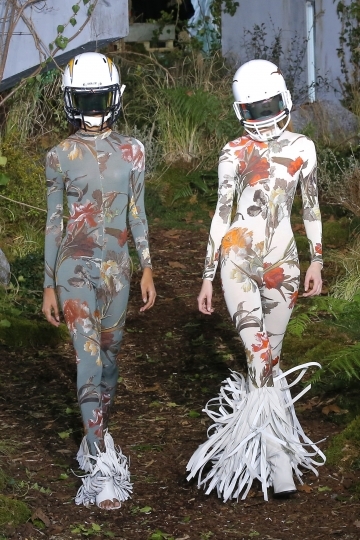 Waight Keller's mission, she said, was to take the hardness out of men's clothes. "My woman in Givenchy has a strength to her ... but I wanted to bring a softer side to the men's. Part of that is (seen) in the flowers, but also in the feel of the roundness, softness and the fluidity of the fabrics," she explained. Slim suits, flared check pants and soft truncated bubble jackets evoked the mix-and-match styles of the haphazard nineties. But the acute precision that has been proven in Waight Keller's couture shows was also abundantly clear in this very strong standalone debut. In a pleated red silk Valentino gown, "Blue Velvet" actress Laura Dern looked very much the part on the design house's front row alongside rapper G. Eazy. As the mother of 17-year-old Ellery Harper — Dern said she was taking an interest in the fashion industry to help her son. "My son is modeling now so I have a particular interest in men's fashion in a new way. I'm fascinated," she said. "You will see him very soon in Paris." Harper has modeled for Calvin Klein under the watchful eye of designer Raf Simons, and Dern says that Valentino's designer Pierpaolo Piccioli has also been "generous" in helping his nascent career. Dern, who came to fame via collaborations with director David Lynch, said she encourages her son to tread carefully in an industry that can be so public, but to relish the opportunities to meet "designers he loves." "When I was his age, I met David Lynch who inspired me so much as an actor. I feel like Ellery should take it slowly and find the people that help him find his destiny." Valentino claimed it was bringing street attitude to the atelier. But for fall-winter, Italian designer Pierpaolo Piccioli seemed to have lost some of his creative attitude after a run of superlatively glorious seasons since he took over the sole artistic reins in 2016. On Wednesday, he played it pretty safe. Round sloping shoulders, boxy torsos and baggy pants defined the silhouette. But much of the creative work, such as contrasting textures and layering, were rendered invisible because of the monochrome. Chaotic scenes abounded in Virgil Abloh's collection for Off-White that was held in a little-known part of the sprawling underbelly of the Louvre as many guests got lost. The museum structure is, by quite a margin, the world's biggest. Bewildered editors wandered in search of the show venue by pyramids, Greco-Roman statues and luxury boutiques to no avail. Some fashion insiders even ended up following unsuspecting tourists in the wrong direction, confusing them as part of the fashion press. Others were led up and down stairs, and above and below ground several times, before finding the proper entrance. Big silhouettes, bold color and urban styles were behind Virgil Abloh's visually arresting fall-winter collection. Concrete slabs were laid among overgrown creepers, grass and ferns as the show decor to evoke a sense of inner-city decay. This was the first clue to understanding the American it-designer's urban vibe that played on excesses in color and overgrown proportion. It's little wonder that the house has, in the recent past, attracted the likes of Jay-Z, Drake and Kanye West. Billowing denim jeans with hanging toggles began an oversize theme, alongside a huge suit jacket and a gargantuan fanny-pack slung across the torso. 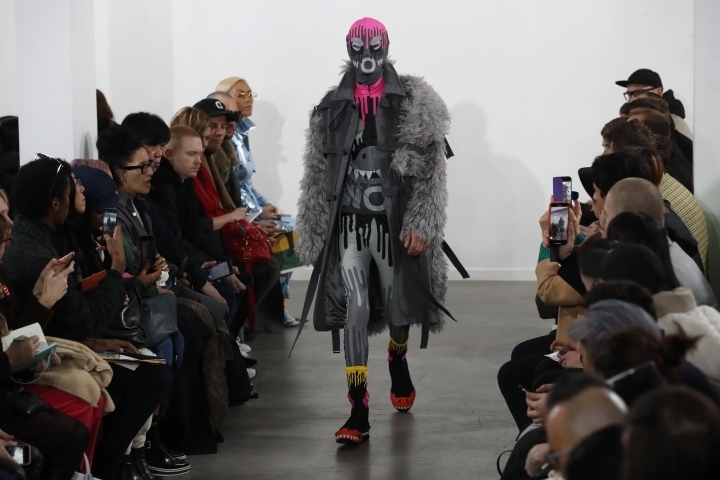 Shredded silver ribbons then cascaded from bell-silhouette Glam Rock boots, followed by contrasting checks and a giant column bubble jacket that did away with the model's body. Abloh later delved into eye-popping neon. Neon oranges, reds and blues in knitted oversize scarves, tops and coats might have reflected the bold hues of urban graffiti. The oft-unwanted street art form was more literally evoked in graffitied text reading "Public Television."